Did you know that up to half of all the dietary supplements you take, never get absorbed! This means that you are literally flushing money down the drain! We all spend time and money taking care of our most valuable vehicle: Our Body! Would you go to the gas pump and pour half of the gas you bought on the ground? Of course not! But every day millions of people consume pills and powders that never get absorbed by the body. Stop flushing your nutrition down the drain! Introducing Viz Nutrition! Nutrition you can feel! Watch our video to learn more about our products. VizComplete is a unique blend of vitamins, minerals and other nutrients, featuring VizPur technology for optimal absorption. VizComplete is a great tasting liquid nutritional product that has been formulated for daily use and multiple servings to feed the body and provide strength to your organs and cells. Men’s Complete contains many key ingredients such as Beta-Carotene, Vitamin D and E, and Co-enzyme Q10, all with the water-soluble advantage of VizPur technology. VizPur Co-enzyme Q10, in concert with the Vitamin B Complex, ensures a supply of energy to your body’s cells. 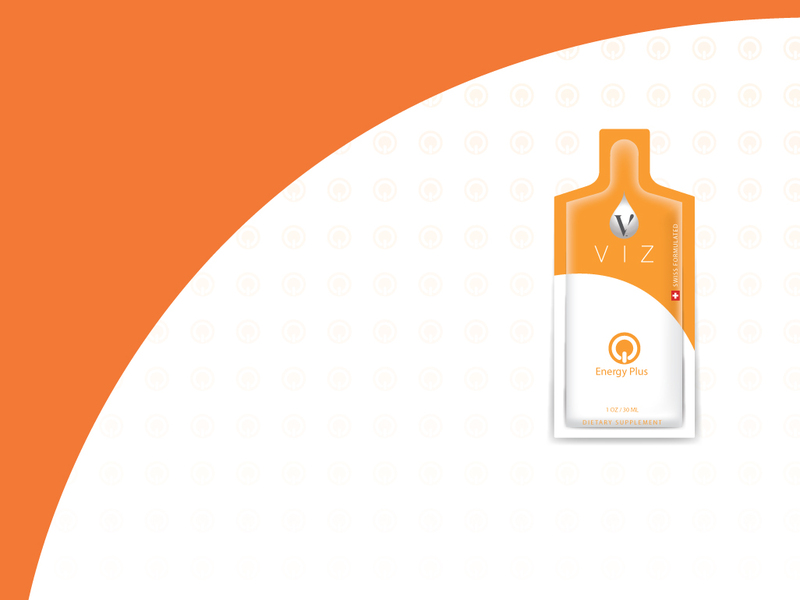 VizPur Beta-Carotene, the safe precursor of vitamin A, is formulated to support many essential processes in the body, such as eye health, supply of blood cells by bone marrow, as well as skin health. VizPur Vitamin D supports bone strength and immune function, while Vitamin E is a powerful protective anti-oxidant. The balanced blend of minerals ensures the appropriate function of many metabolic processes and avoids mineral deficiencies. 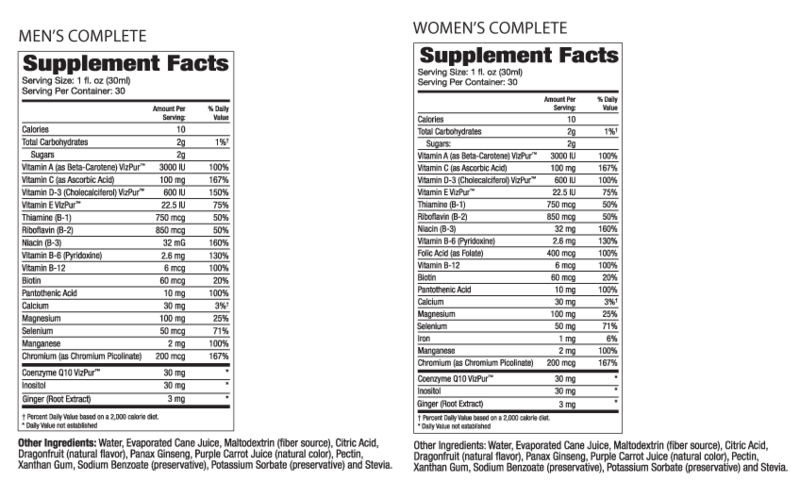 Women’s Complete contains the same key ingredients as the Men’s but adds iron and folic acid for the additional benefit to a woman. Take 1 – 2 fluid ounces per day as directed by your health care provider. Additional servings may be taken during the day as needed. Formulated to deliver energy for your entire body and mental focus throughout the day. Viz Energy Plus helps you perform at your peak level, whether you are exercising or engaged in the never-ending demands of a busy day. Energy Plus is a unique blend of ingredients that work together to provide energy to the cells of your body and help to create and maintain your muscle strength. 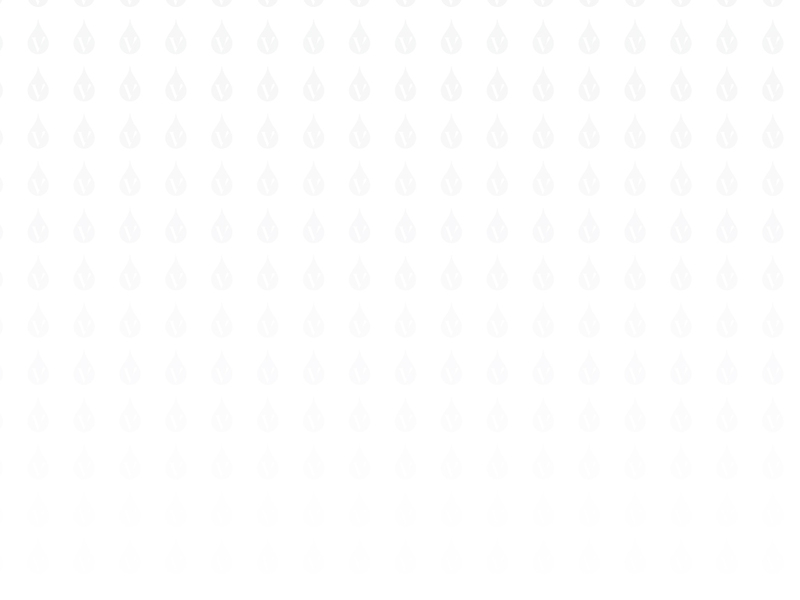 And VizPur technology ensures that the key nutrients in Energy Plus are water-soluble and bio-available. To function, muscle cells have to generate ATP, a small molecule that provides the ultimate power to each cell. ATP is generated by the nutrients you consume and store in your body. The rich blend of nutrients in Energy Plus, includes Coenzyme Q10 and Vitamin B Complex for facilitating ATP production in your cells, and provides the ideal formulation for energy production. Your peak performance also depends heavily on the right mental strength. Energy Plus uses the power of natural plant extracts, such as L-Theanine and Siberian Ginseng Extract, together with natural caffeine for mental clarity. Take 1 fluid ounce per day as directed by your health care provider. Normalizes and balances your digestive tract. Viz Clean Plus helps to rejuvenate your metabolism. It normalizes and balances your digestive tract to prevent inflammation, irritation and constipation through a blend of valuable natural ingredients. Frankincense is a resin from the Boswelliaserrata tree, which grows in very limited habitats, such as in parts of India and the Middle East. Known from ancient times as a healing agent, it has gained new interest by demonstrating potent anti-inflammatory effects. Milk thistle is an extract derived from a plant growing in the Mediterranean that has long been known as a liver tonic due to its unique components, silymarin and unsaturated fatty acids. Black walnut hull extract helps your digestive tract protect itself from the growth of harmful pathogens, while Senna leaf extract and aloe vera act as relaxing agents for the lower intestine. 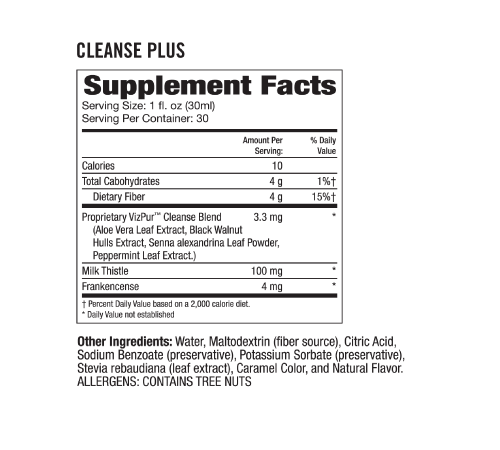 Clean Plus is also blended with Fibersol, a highly water-soluble fiber product that helps to normalize your intestinal motion. Frankincense and milk thistle, in particular, have not been used effectively in nutraceuticals since they are not water-soluble. VizPur technology brings these gifts of nature to your body, fully unleashing their power in a way that simply was not possible. A unique blend of important nutrients that reduce your body’s inflammation and protect cardio health. Super Omega Plus offers a proprietary formula of krill oil blended with Coenzyme Q10 and Vitamins D and E. Together, these super nutrients achieve optimal protection and restoration of cells in your body, reduce inflammation and give your body the right power on time, all while allowing your body to relax. VizPur technology makes the krill oil, Vitamins D and E, and Coenzyme Q10 water-soluble, and available to your body. 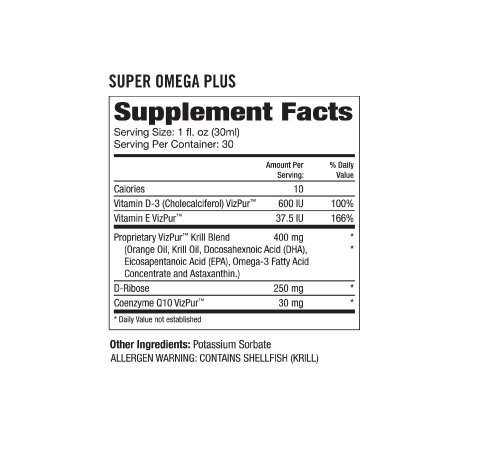 Which means Super Omega Plus is the first time that these powerful ingredients can be fully used by your body. Krill oil’s main components are Omega 3 fatty acids and the antioxidant astaxanthin, which offer potent anti-inflammatory and cardio-protective effects that have been proven by numerous clinical trials. Populations with high intake of these, such as Inuit, have significantly lower rates of cardiovascular issues as compared to others. Omega 3 fatty acids usually need a high dose to achieve their effect, which comes with the unwanted side effects of unpleasant smell and taste. With VizPur technology, you require much lower dosages to achieve the necessary blood levels for effectiveness without the unwanted side effects. CoQ10, a proven natural agent that provides energy to all cells, especially those found in muscle, the brain and heart, synergizes with the krill oil. Together with Vitamin D and the non-diabetogenic sugar L-Ribose, optimal protection and performance is achieved. Heavy Metal in Your Blood? 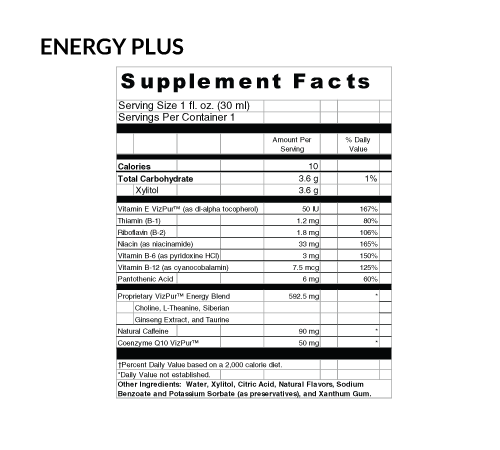 PurZ™ patent pending formulation helps stimulate activity in the brain. PurZ™ is water soluble and works in both the mind and body to support the body’s natural detoxification systems. 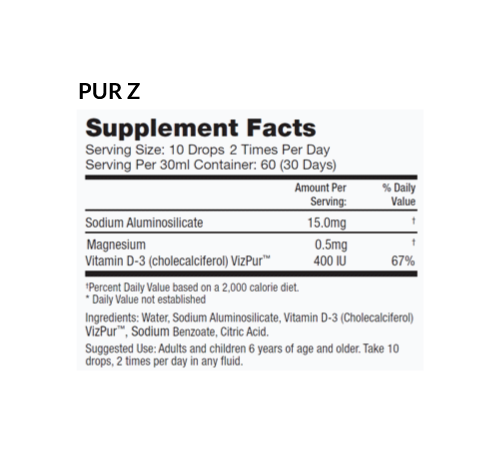 This proprietary blend of amino acids is specifically designed to help support concentration, focus, and memory. By combining PurZ™ with VizPUR™ technology, a proprietary formula created to support environmental toxin removal while providing nutrients to support health and vitality. This patent pending product helps remove toxins including lead, mercury, arsenic, cadmium, chromium, pesticides and solvents. The removal process captures these environmental toxins and holds them until passed through the body. PurZ™ helps support proper cellular nutrition, protein formation, and healthy brain function. Nestled in the beautiful mountain town of Davos, Switzerland, comes VizPur™ a proven, unique, patented process that makes fat-soluble nutrients dramatically more available to the body. This technology allows essential nutrients such as Vitamins, A, D and E, the super-nutrient, Coenzyme Q10, most plant extracts and essential oils to become water-soluble and therefore more absorbable to your body. 10 Drops - 2 Times Per Day. Welcome to a new standard of absorbability in oils! VIZ is proud to offer the first and only essential oils that are built on the patented Swiss VizPur solubilization technology. This truly unique technology transforms traditional fat soluble essential oils into readily absorbed, water soluble products. This means that you get all of the traditional and powerful benefits of essential oils, without your body having to do the work of converting the fats into an absorbable form. This groundbreaking technology breaks down fat into a useable form in the same your body does, naturally, through micellization. Water soluble essential oils are clean, pure and efficient, without changing the essence of the oil. VIZ’s line of oils feature both traditional essential oils and our state of the art VizPur water soluble oils. For the first time, you will have the freedom to choose which type of oil you want to use, or even combine for massage therapy, aroma therapy personal care and nutritional uses! VIZ Essential Oils are all therapeutic grade, organic and/or wild-crafted. The product line is all made from steam distilled oils, avoiding the use of hexane and other harsh solvents. We source only the highest quality oils, from known and dependable providers, to ensure the most effective and safe oils available. Most commonly used in cooking. Its aroma and flavor is widely recognized. Inhaling basil can provide mental clarity and focus. In addition, Basil can be beneficial for soothing sore muscles and joints. Basil is for topical, aromatic, or dietary use. Birch has been used by Native American cultures for its anti-inflammatory properties. Birch can be used to provide comfort from sore joints, bones. Birch is for topical, aromatic, or dietary use. Caution: Birch can act as a blood thinner, and should not be used prior to surgery or while taking blood thinners. Best known for its use as a spice in flavoring food. Cinnamon is thought to promote healthy cardiovascular and immune function. It may also be used as an antiseptic and for intestinal concerns. Cinnamon is for topical, aromatic, or dietary use. Dried flower buds (whole cloves) extracted by water (occasionally steam) distillation. Clove has been used for centuries as a spice to enhance the flavor of food. Clove is considered to be a powerful antioxidant, and is widely used and recognized for its many healing properties. Clove can be effective in numbing gums and toothaches. Clove is an effective natural blood thinner. Clove Bud is for topical, aromatic, or dietary use. Caution: Consult your doctor if using Coumadin. Avoid during pregnancy. Most commonly used for its benefits to the respiratory system. It is a key ingredient in many cough, throat and chest ointments. Eucalyptus Radiata is calming and gentle, making it a preferred choice for children. Eucalyptus Radiata is for topical, aromatic, or dietary use. Frankincense, from the BoswelliaSarrata tree, has been used for centuries for its relaxing qualities. Frankincense is commonly used as a immune support and mood enhancement. Frankincense is also a valuable ingredient used in many skin care products to comfort drying and aging skin. Frankincense is for topical, aromatic, or dietary use. Ginger is best known for its benefit and support of the digestive system. It is commonly used as a remedy for nausea, morning sickness and indigestion. Ginger is for topical, aromatic or digestive use. A popular ingredient used extensively in many skin care products. It has benefits for joint support, as well as providing support to the circulatory and nervous systems. Geranium is beneficial for calming stress and for balancing emotions. Geranium is for topical, aromatic or dietary use. Lavender is one of the most popular oils, and has been used for centuries for its familiar aroma and soothing qualities. Lavender is an adaptogen and can assist the body in managing stress. Lavender is for topical, aromatic, or dietary use. Lemon oil: Extracted by cold extraction. Lemon has traditionally been used for its antioxidant, anti-bacterial, and purifying qualities. Lemon oil can be used as a non-toxic cleanser and sanitizer. Lemon also has a clean and fresh aroma. It's invaluable in the kitchen and laundry. Lemon oil is for topical, aromatic, or dietary use. Caution: Lemon oil may cause photo-sensitivity. Orange oil has a wonderful fruity scent that can be calming, as well as to bring happiness and peace to the mind and body. Orange has a high concentration of limonene, a powerful antioxidant that supports a healthy immune system. Orange is for topical, aromatic, or dietary use. Leaves and flowering tops extracted by steam distillation. Oregano has been used for centuries as a spice to enhance the flavor of food. Oregano is also used for digestive, respiratory and immune support, and is considered to be highly effective against bacterial infections. Oregano has been referred to as “nature’s antibiotic”. Oregano can also be used as a cleaning agent, and is suitable for topical, aromatic, or dietary use. Caution: Traditional Oregano oil should always be used with a carrier oil for dilution. Whole plant extracted by steam distillation. Peppermint is one of the most versatile of Essential oils. Peppermint is very helpful in supporting digestion, and addressing several digestive issues at once. It is a very cooling oil. Peppermint oil is anti-inflammatory, antiseptic, and may provide natural relief from pain. Peppermint is for topical, aromatic, or dietary use. Blossom and plant extracted by steam distillation. Rosemary has been used for centuries and was considered sacred by ancient Greeks, Egyptians, and Hebrews. Rosemary is beneficial for mental clarity as well as for muscle aches and pains. Rosemary is also a popular ingredient for skin care and hair products. Rosemary is for topical, aromatic, or dietary use. Caution: Use caution if you are prone to epileptic seizure or hypertension. Tea Tree, also known as Melaleuca oil, is best known for its benefits in supporting the body’s own immune system and health. Tea Tree has limitless therapeutic applications, and is the first oil taken when feeling the early symptoms of cold, flu, etc. Tea Tree has strong cleansing and regenerative properties. Tea Tree is for topical, aromatic, or dietary use. Introducing an exciting new product formulated for women’s need for circulation, warmth, mutual stimulation. Using Nobel Prize winning technology, LaVoe will help support cardiovascular health and enhance sexual intimacy through the nitric oxide system. LaVoe is a fast acting gel which will provide mutual stimulation and enhancement. Women and men will enjoy the mutual sensations that can increase the sensitivity of intimate areas. Warning: Do not use on eyes or ears as it may cause irritation. LaVoe is not a contraceptive and does not contain a spermicide. A Vitamin so good, you can take it Five Days a week! How can you do this? Thanks to Viz Nutrition, you can now take you daily vitamins every other day! Vitacyle Vitamins are completely absorbed directly into the cells of your body so taking an Vitacycle vitamin every other day is much more efficient that taking a poorly absorbed vitamin every day. Did you know that almost half of all the vitamin supplements are not absorbed? Vitamin, A, D, E, Omega 3, CoQ10 are all oil based and poorly absorbed by the body, so taking them every day. Vitacycle works with your body’s natural absorption and metabolism cycles. Vitacycle products are formulated with VizPur® which mimic the body’s natural absorption. VIZ Nutrition’s VIP Gold is a Fast-Acting Supplement Strip designed to Enhance libido and sexual health. Using Natural Ingredients and VizPur® technology, VIP GOLD starts working 20 minutes before sexual activity and lasts up to 24 hours. Directions: Take one strip per day on an empty stomach. Please place strip on or under tongue and allow to dissolve in mouth. Do not eat or drink for one hour except water. Starts working within 20-60 minutes. Many cause a brief flushing or warmth sensation which is normal and temporary. Intended for internal use only. Warning: Not for use by individuals under 18 years of age. Do not use if you are pregnant or nursing. Consult a physician or health care professional before using this product if you have any medical condition. Do not exceed recommended serving. KEEP OUT OF REACH OF CHILDREN. These statements have not been approved by the Food and Drug Administration. This product is not intended to diagnose treat, cure or prevent any disease.